CNG: Printed Auction CNG 75. ARGOLIS, Argos. Circa 420/10-370 BC. AR Obol (0.75 g, 12h). Sale: CNG 75, Lot: 318. Estimate $200. ARGOLIS, Argos. Circa 420/10-370 BC. AR Obol (0.75 g, 12h). Wolf’s head right / Large A; two deep incuses above, Q below; all within concave circle. 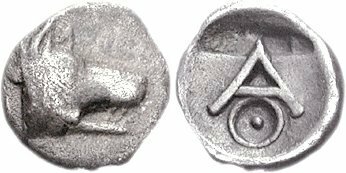 BCD Peloponnesos 1042 (this coin); SNG Copenhagen 16-17 (same obv. die). VF, toned, slight granularity. Very rare. Ex BCD Collection (LHS 96, 8 May 2006), lot 1042.